Now that the September heatwave is officially over, it’s time to welcome the cooler days of October and everything they have to offer. And since October is a month with not one but two holidays, most of us might be tempted to overindulge. However, there are ways to make it through the month without completely draining your wallet. Here are a few tips. Meal prepping isn’t exactly a new trend, but it has taken off in recent years thanks to Instagram. And while you can meal prep all year round, rich fall dishes like creamy soups and hearty stews are great options for many reasons. For one, it’s super easy to double or triple a recipe depending on your needs. Plus they reheat well and can often taste better the day after. If you’re looking for inspiration, Toronto food blogs like Abbey’s Kitchen and Closet Cooking have some great soup and stew recipes that will surely spice up your weekday work lunch. It’s #PSL season, but at almost six dollars a pop, those sweet sips can really add up. If you’re penny-pinching this fall, opting for a more basic drink like coffee or tea instead of a seasonal speciality can help. Additionally, if you bring your own mug, many coffee shops will offer you a discount. Lastly, if you have a loyalty card when used responsibly, it can help you save as the dollars you spend earn you free drinks. ‘Tis the season for warehouse and sample sales, and if you live in the GTA, there are plenty in the area to peruse. You’ll be saving up to 80% — or if you’re lucky, up to 90% — on furniture, clothing, footwear and more. Stay in the loop about when these sales are happening by signing up for our mailing list or checking out our event listings. If you want to save even more money, DIY your costume instead. There are ton of costumes in your closet, you just have to get creative. Have a plaid shirt? You’re a lumberjack. Got a yellow sweater you never wear anymore? 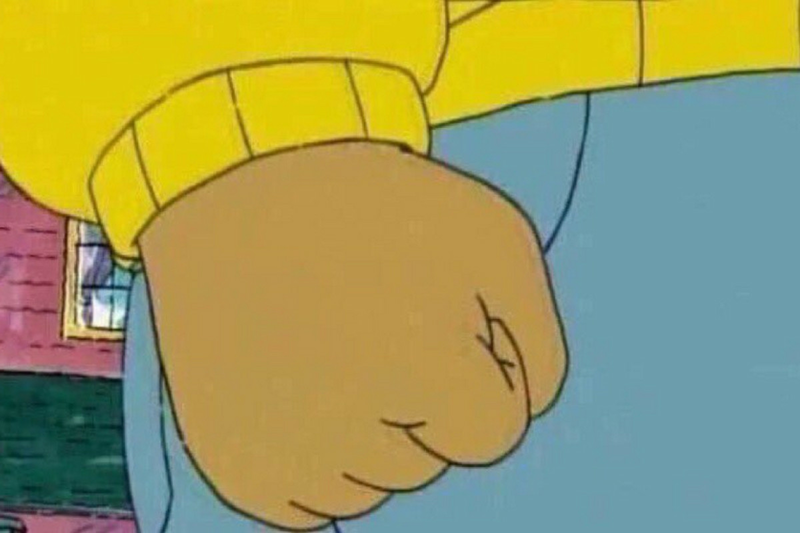 Dig it up, put your hand into a fist, and you’re this classic Arthur meme. Have a leather jacket you’ve been dying to wear? Wear all black and suddenly you’re Sandy or Danny from Grease. The options are endless! Get more ideas here. Do you have any other tips on how to save money this October?